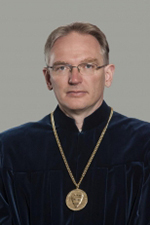 Dr. Imre Juhász was elected Judge of the Constitutional Court by Parliament in March 2013. He studied law at the Faculty of Law of Eötvös Lóránd University in Budapest and graduated in 1986. He was qualified as a lawyer in 1989. He received his second law degree specialized in European Law in 2000 and accredited as a Ph.D in 2011. Between 1986 and 1992 he was assistant of professor at the Department of Civil Procedural Law at the Faculty of Law of Eötvös Loránd University. From 1990/1991 he worked as legal representative and private barrister. He qualified as a lecturer from 1992. In the first half of 1990s he took part in the activity of legal protection programme of the UN High Commissioner for Refugees. He was founding member of the Committee of Lawyers which investigated the large number of police attacks that violated human rights in autumn 2006 in Hungary. From January 2008 he was member of Independent Police Complaints Board and from 2010 he was the chairman of the Board. The Committee of Ministers of the Council of Europe confirmed his appointment as member of the European Commission against Racism and Intolerance (ECRI). From 1 January 2013 he represents Hungary in the Commission.